"Percy Shelley" redirects here. For the son of the poet, see Percy Florence Shelley. For the English potter, see Percy Shelley (potter). Percy Bysshe Shelley (/bɪʃ/ ( listen) BISH; 4 August 1792 – 8 July 1822) was one of the major English Romantic poets, who is regarded by some as among the finest lyric and philosophical poets in the English language, and one of the most influential. A radical in his poetry as well as in his political and social views, Shelley did not see fame during his lifetime, but recognition of his achievements in poetry grew steadily following his death. 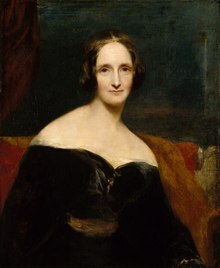 Shelley was a key member of a close circle of visionary poets and writers that included Lord Byron, John Keats, Leigh Hunt, Thomas Love Peacock, and his own second wife, Mary Shelley, the author of Frankenstein. Shelley is perhaps best known for classic poems such as "Ozymandias", "Ode to the West Wind", "To a Skylark", "Music, When Soft Voices Die", "The Cloud", and "The Masque of Anarchy". His other major works include a groundbreaking verse drama The Cenci (1819) and long, visionary, philosophical poems such as Queen Mab (later reworked as The Daemon of the World), Alastor, The Revolt of Islam, Adonaïs, Prometheus Unbound (1820)—widely considered to be his masterpiece—Hellas: A Lyrical Drama (1821), and his final, unfinished work, The Triumph of Life (1822). 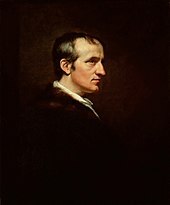 Shelley's close circle of friends included some of the most important progressive thinkers of the day, including his father-in-law, the philosopher William Godwin, and Leigh Hunt. Though Shelley's poetry and prose output remained steady throughout his life, most publishers and journals declined to publish his work for fear of being arrested for either blasphemy or sedition. 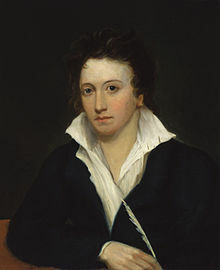 Shelley's poetry sometimes had only an underground readership during his day, but his poetic achievements are widely recognized today, and his political and social thought had an impact on the Chartist and other movements in England, and reach down to the present day. Shelley's theories of economics and morality, for example, had a profound influence on Karl Marx; his early—perhaps first—writings on nonviolent resistance influenced Leo Tolstoy, whose writings on the subject in turn influenced Mahatma Gandhi, and through him Martin Luther King Jr. and others practicing nonviolence during the American civil rights movement. Shelley became a lodestar to the subsequent three or four generations of poets, including important Victorian and Pre-Raphaelite poets such as Robert Browning and Dante Gabriel Rossetti. He was admired by Oscar Wilde, Thomas Hardy, George Bernard Shaw, Leo Tolstoy, Bertrand Russell, W. B. Yeats, Upton Sinclair and Isadora Duncan. Henry David Thoreau's Civil Disobedience was apparently influenced by Shelley's writings and theories on non-violence in protest and political action. Shelley's popularity and influence has continued to grow in contemporary poetry circles. The Funeral of Shelley by Louis Édouard Fournier (1889). Pictured in the centre are, from left, Trelawny, Hunt, and Byron. 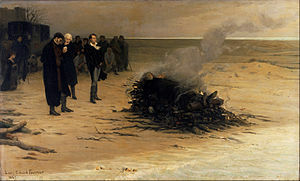 In fact, Hunt did not observe the cremation, and Byron left early. Mary Shelley, who is pictured kneeling at left, did not attend the funeral according to customs at the time. Shelley's grave in Rome (some phrases of Ariel's Song (from Shakespeare's The Tempest) appear below. Shelley's widow Mary bought a cliff-top home at Boscombe, Bournemouth, in 1851. She intended to live there with her son, Percy, and his wife Jane, and had the remains of her own parents moved from their London burial place at St Pancras Old Church to an underground mausoleum in the town. The property is now known as Shelley Manor. When Lady Jane Shelley was to be buried in the family vault, it was discovered that in her copy of Adonaïs was an envelope containing ashes, which she had identified as belonging to her father-in-law. The family had preserved the story that when Shelley's body had been burned, his friend Edward Trelawny had snatched the whole heart from the pyre. These same accounts claim that the heart had been buried with Shelley's son, Percy. All accounts agree, however, that the remains now lie in the vault in the churchyard of St Peter's Church, Bournemouth. Henry Shelley became father to younger Henry Shelley. This younger Henry had at least three sons. The youngest of them, Richard Shelley was born in 1583, and baptized 17 November 1583 in Warminghurst, Sussex, England. Richard later married on 3 February 1601 in Itchingfield to Jonne (aka Joane) Feste/Feest/Fuste, daughter of John Feest/Fuste from Itchingfield, near Horsham, West Sussex. Their grandson, John Shelley of Fen Place, Turners Hill, West Sussex, was married himself to Helen Bysshe, daughter of Roger Bysshe. Their son Timothy Shelley of Fen Place (born c. 1700) married widow Johanna Plum from New York City. Timothy and Johanna were the great-grandparents of Percy. Percy was born to Sir Timothy Shelley (1753–1844) and his wife Elizabeth Pilfold following their marriage in October 1791. His father was son and heir to Sir Bysshe Shelley, 1st Baronet of Castle Goring (1731–1815) by his wife Mary Catherine Michell (d. 1760). His mother was daughter of Charles Pilfold of Effingham. Through his paternal grandmother, Percy was a great-grandson to Reverend Theobald Michell of Horsham. Through his maternal and paternal lineage, he was a cousin of Thomas Medwin—a childhood friend and Shelley's biographer. Several members of the Scarlett family were born at Percy Florence's seaside home "Boscombe Manor" in Bournemouth. They were descendants of Percy Florence's and Jane Gibson's adopted daughter, Bessie Florence Gibson. The 1891 census shows Lady Jane Shelley, Percy Florence Shelley's widow, living at Boscombe Manor with several great-nephews. Percy Florence Shelley died in 1889, and his widow, the former Jane St. John (born Gibson), died in 1899. Shelley's mainstream following did not develop until a generation after his death, unlike Lord Byron, who was popular among all classes during his lifetime despite his radical views. For decades after his death, Shelley was mainly appreciated by only the major Victorian poets, the pre-Raphaelites, the socialists, and the labour movement. One reason for this was the extreme discomfort with Shelley's political radicalism, which led popular anthologists to confine Shelley's reputation to the relatively sanitised "magazine" pieces such as "Ozymandias" or "Lines to an Indian Air". He was admired by C. S. Lewis, Karl Marx, Robert Browning, Henry Stephens Salt, Gregory Corso, George Bernard Shaw, Bertrand Russell, Isadora Duncan, Constance Naden, Upton Sinclair, Gabriele d'Annunzio, Aleister Crowley, and W. B. Yeats. Shelley had an enduring and profound influence on the Dutch poets of "De nieuwe Gids" (Kloos, Van Eeden e.a.). Samuel Barber, Sergei Rachmaninoff, Roger Quilter, Howard Skempton, John Vanderslice, and Ralph Vaughan Williams composed music based on his poems. Critics such as Matthew Arnold endeavoured to rewrite Shelley's legacy to make him seem a lyricist and a dilettante who had no serious intellectual position and whose longer poems were not worthy of study. Arnold famously described Shelley as a "beautiful and ineffectual angel". This position contrasted strongly with the judgement of the previous generation who knew Shelley as a sceptic and a radical. Many of Shelley's works remained unpublished or little known after his death, with longer pieces such as A Philosophical View of Reform existing only in manuscript until the 1920s. This contributed to the Victorian idea of him as a minor lyricist. With the inception of formal literary studies in the early twentieth century and the slow rediscovery and re-evaluation of his oeuvre by scholars such as Kenneth Neill Cameron, Donald H. Reiman, and Harold Bloom, the modern idea of Shelley could not be more different. Paul Foot, in his Red Shelley, has documented the pivotal role Shelley's works—especially Queen Mab—have played in the genesis of British radicalism. Although Shelley's works were banned from respectable Victorian households, his political writings were pirated by men such as Richard Carlile who regularly went to jail for printing "seditious and blasphemous libel" (i.e. material proscribed by the government), and these cheap pirate editions reached hundreds of activists and workers throughout the nineteenth century. Shelley's poem, "To the Queen of My Heart", was allegedly forged and falsely attributed to Shelley by James Augustus St John, who took over as editor of the London Weekly Review when Carlile was imprisoned in 1827. Paul Johnson, in his book Intellectuals, describes Shelley in a chapter titled "Shelley or the Heartlessness of Ideas". In the book, Johnson describes Shelley as an amoral person, who by borrowing money which he did not intend to return, and by seducing young innocent women who fell for him, destroyed the lives of everybody with whom he had interacted, including his own. The rediscovery in mid-2006 of Shelley's long-lost "Poetical Essay on the Existing State of Things", as noted above, was slow to be followed up until the only known surviving copy was acquired by the Bodleian Library in Oxford as its 12-millionth book in November 2015 and made available online. An analysis of the poem by the only person known to have examined the whole work at the time of the original discovery appeared in the Times Literary Supplement: H.R. Woudhuysen, "Shelley's Fantastic Prank", 12 July 2006. In 2007 John Lauritsen published The Man Who Wrote Frankenstein, in which he argued that Percy Bysshe Shelley's contributions to the novel were much more extensive than had previously been assumed. It has been known and not disputed that Shelley wrote the Preface—although uncredited—and that he contributed at least 4,000–5,000 words to the novel. Lauritsen sought to show that Shelley was the primary author of the novel. In 2008 Percy Bysshe Shelley was credited as the co-author of Frankenstein by Charles E. Robinson in a new edition of the novel entitled The Original Frankenstein published by the Bodleian Library in Oxford and by Random House in the US. Robinson determined that Percy Bysshe Shelley was the co-author of the novel: "He made very significant changes in words, themes and style. The book should now be credited as 'by Mary Shelley with Percy Shelley'." In late 2014 Shelley's work led lecturers from the University of Pennsylvania and New York University to produce a Massive open online course (MOOC) on the life of Percy Shelley and Prometheus Unbound. Howard Brenton's play, Bloody Poetry (1984), explores the complex relationships and rivalries between Shelley, Mary Shelley, Claire Clairmont, and Byron. Shelley is portrayed in Blackadder's third-season episode "Ink and Incapability" as one of Samuel Johnson's admirers. He is played by Lee Cornes. The last line of Stanza LIII of Shelley's elegy of John Keats, Adonais "No more let Life divide what Death can join together." is referenced a number of times by major characters in the Showtime/Sky Victorian horror series Penny Dreadful. Some of Shelley's poems are mentioned in the detective videogame L.A. Noire, where they are used for solving a series of murders. During the 2017 elections in the United Kingdom, Jeremy Corbyn frequently quoted the final stanza of Shelley's 1819 poem, The Masque of Anarchy, which begins, "Rise like lions after slumber, in unvanquishable number!" The words came to be used by Corbyn supporters as a sort of unofficial battle cry. ^ a b Duncan, Isadora (1996). My Life. W. W. Norton & Co. pp. 15, 134. ^ Medwin, Thomas (1847). The Life of Percy Bysshe Shelley. London: Thomas Cautley Newby. p. 323. ^ Shelley, Percy Bysshe (2013). Delphi Complete Works of Percy Bysshe Shelley (Illustrated). Delphi Classics. ISBN 978-1909496071. Retrieved 6 February 2019 – via Google Books. ^ Bieri, James (2018). Percy Bysshe Shelley: A Biography : Youth's Unextinguished Fire, 1792–1816. University of Delaware Press. ISBN 978-0874138702. Retrieved 13 October 2018 – via Google Books. ^ "Elizabeth Lady Shelley". knarf.english.upenn.edu. ^ Gilmour, Ian (2002). Byron and Shelley: The Making of the Poets. New York: Carol & Graf Publishers. pp. 96–97. ^ a b Bieri, James (2004). Percy Bysshe Shelley: A Biography: Youth's Unextinguished Fire, 1792–1816. Newark: University of Delaware Press. p. 86. ^ Cory, William, "Shelley at Eton", The Shelley Society's Note-Book, part 1, 1888, pp. 14–15. ^ India Knight. "Article in the Times Online". The Times. Retrieved 8 March 2010. ^ A second marriage took place at St George’s Hanover Square on 24th March 1814, to obviate all doubts that have arisen concerning the marriage that took place in Scotland. Harriet’s father gave his permission as she was a minor. Entry confirmed in parish registers. ^ James Bieri, Percy Bysshe Shelley: A Biography (Baltimore: Johns Hopkins University Press, 2008) p. 73. ^ Bieri (2008), pp. 154–76. ^ Bieri (2008), p. 195. ^ Bieri (2008), p. 185. ^ Bieri (2008), pp. 188 and 189. For comparison, Jane Austen, in her novel Pride and Prejudice, set during this period, describes Mr. Darcy's annual income as 10,000 £. See i Brad deLong's discussion of this in "How Rich is Mr. Darcy?" ^ "The Shelley 'fortune' promised fiscal relief for Godwin in accordance with the tenets of equitable distribution of wealth advocated in Political Justice and subscribed to by his new pupil" (Bieri , p. 189). ^ Bieri (2008), p. 256. "Responding to Shelley's willingness to compromise, the Duke brought father and son together at a large party. According to Hogg, the Earl of Oxford pointed to Timothy and asked a pleased Shelley, 'Pray, who is that very strange old man... who talks so much, so loudly, and in so extraordinary a manner, and all about himself.' Shelley identified his father and walked home with the Earl" (Bieri , pp. 256–57). ^ Bieri (2008), p. 199. ^ An advertisement in the Dublin Evening Post, quoted in Bieri (2008), p. 200. ^ Bieri (2008), p. 285. ^ Bieri (2008), p. 364. ^ Volokh, Eugene. "Parent-Child Speech and Child Custody Speech Restrictions" (PDF). UCLA. Retrieved 9 November 2015. ^ For details of Harriet's suicide and Shelley's remarriage see Bieri (2008), pp. 360–69. ^ Edward Chaney. 'Egypt in England and America: The Cultural Memorials of Religion, Royalty and Religion', Sites of Exchange: European Crossroads and Faultlines, eds. M. Ascari and A. Corrado. Amsterdam and New York: Rodopi, 2006, pp. 39–69. The bust had already been described as 'certainly the most beautiful and perfect piece of Egyptian sculpture that can be seen throughout the whole country', by W. R. Hamilton, in his remarkable Aegyptiaca in 1809. Had Shelley known how celebrated both Rameses and his bust/s would become, he might have chosen a better example of Nemesis. ^ MacCarthy, Fiona (2014). Byron: Life and Legend. Hachette UK. ISBN 978-1444799873. ^ Eisler, Benita (1999). Byron: Child of Passion, Fool of Fame. Knopf Doubleday Publishing Group. p. 668. ISBN 978-0307773272. .
^ Emily W. Sunstein,Mary Shelley: Romance and Reality (New York: Little Brown, 1989), p. 175. ^ Timothy Morton, Shelley and the Revolution in Taste: The Body and the Natural World (Cambridge Studies in Romanticism, 1994), p. 232. ^ "Celebrity Body Parts: 10 Priceless Pieces of History". Foxnews.com. 20 July 2008. Retrieved 8 March 2010. ^ "Please take your seats". Bournemouth Echo. ^ Baptism Record of Richard Shelley. Ancestry.com. England, Select Births and Christenings, 1538–1975 (database on-line). Provo, UT: Ancestry.com Operations, Inc., 2014. Original data: England, Births and Christenings, 1538–1975. Salt Lake City, Utah: FamilySearch, 2013. Paid subscription site, accessed May 2017. ^ Marriage Record of Richard Shelly and Jonne Feste. Ancestry.com. England, Select Marriages, 1538–1973 [database on-line. Provo, UT: Ancestry.com Operations, Inc., 2014. Original data: England, Marriages, 1538–1973. Salt Lake City, Utah: FamilySearch, 2013. Paid subscription site, accessed May 2017. ^ Thomas Weber, "Gandhi as Disciple and Mentor," Cambridge University Press, 2004, p. 28. ^ Hasan, Mahmudul. "The Theme of Indianness in the Works of PB Shelley: A Glimpse into Ancient India." ^ Spencer, Colin. The Heretic's Feast: A History of Vegetarianism. Great Britain: Hartnolls Ltd, Bodmin. 1993, pp. 244–45. ^ Morton, Timothy, "Joseph Ritson, Percy Shelley and the Making of Romantic Vegetarianism." Romanticism, Vol. 12, Issue 1, 2006. pp. 52–61. ^ Hasan, Mahmudul, "The Theme of Indianness in the Works of P B Shelley: A Glimpse into Ancient India." Galaxy: An International Multidisciplinary Research Journal, Vol. 5, Issue 5, 2016. pp. 30–39. ^ a b Shelley, Percy Bysshe, "A Vindication of Natural Diet;" London: Smith & Davy. 1813, pp. 1–36. ^ Preece, Rod. Sins of the Flesh: A History of Ethical Vegetarian Thought. Vancouver: University of British Columbia Press, 2008. ^ "Poems of the Week". Themediadrome.com. Archived from the original on 15 February 2010. Retrieved 8 March 2010. ^ Upton Sinclair, "My Lifetime in Letters", Univ of Missouri Press, 1960. ^ Donald Reiman and Neil Fraistat (eds. ), The Complete Poetry of Percy Bysshe Shelley, Vol. 1 (Baltimore: John Hopkins University Press, (2000). ^ HarperCollins, 2007. First published in 1988. ^ "Shelley's Poetical Essay: The Bodleian Libraries' 12 millionth book". Oxford: Bodleian Library. November 2015. Retrieved 2015-11-13. ^ Woudhuysen, H.R. (2006-07-12). "Shelley's fantastic prank: An extraordinary pamphlet comes to light". The Sunday Times. London. Retrieved 2010-08-04. ^ John Lauritsen (2007). The Man Who Wrote "Frankenstein". Pagan Press. ISBN 978-0-943742-14-4. ^ Ltd., Open Learning Global Pty. "on openlearning.com". openlearning.com. ^ "Keats-Shelley Association of America » The Unbinding Prometheus Project". k-saa.org. ^ "Venetia Review, vol. 1 No. 1". "New Monthly Review (available online at Google books). 1837. p. 130. Retrieved 2007-10-11. ^ "Percy Bysshe Shelley". Spoon River Anthology. Archived from the original on 7 February 2010. Retrieved 8 March 2010. ^ Mary Shelley – Reviews – 15 Jun 2012. Whatsonstage.com (15 June 2012). ^ "Six oies cendrées". 30 April 2018. ^ "<Italique>Six Oies cendrées</Italique> par Henri Coulonges". 7 June 2001. ^ ""Rise like lions after slumber": why do Jeremy Corbyn and co keep reciting a 19th century poem?". www.newstatesman.com. ^ Plato, The Banquet, translated by Percy Bysshe Shelley, Pagan Press, Provincetown 2001, ISBN 0-943742-12-9. Shelley's translation and his introductory essay, "A Discourse on the Manners of the Antient Greeks Relative to the Subject of Love", were first published unbowdlerized in 1931. ^ "Percy Bysshe Shelley: "The Sensitive Plant" from Andre digte". Kalliope. Retrieved 5 October 2018. ^ Grande, James. Review: The Original Frankenstein, By Mary Shelley with Percy Shelley ed Charles E Robinson. "To what extent did Percy Bysshe Shelley work on 'Frankenstein'? A new analysis reveals all.". The Independent' (16 November 2008). Holmes, Richard. Shelley: The Pursuit. New York: E.P. Dutton, 1975. Meaker, M.J. Sudden Endings, 12 Profiles in Depth of Famous Suicides, Garden City, New York, Doubleday, 1964 pp. 67–93: "The Deserted Wife: Harriet Westbrook Shelley".